Today, the smartphone application “Pokemon GO” is rolled out. Even in Kyoto, where has Nintendo headquarter, many players enjoyed playing games with smartphones. In this article, we give information about a look of playing Pokemon GO in Kyoto city and our favor to ask you enjoying safely. Taking photo with Pokemon at the historical site of Kyoto. The Ichijo Modori-bashi Bridge is a bridge on Ichijo-dori Street over the Hori-kawa River located in Kamigyo Ward, Kyoto City. The theory have been told as regard to the bridge : the bridge was built in 794 due to the relocation of the Capital to Heian-Kyo City. Seimei-jinja Shrine was located approximately 100 meters west of this brifge. The Shrine was erected in Onmyoji : Abe no Seimei’s residence. 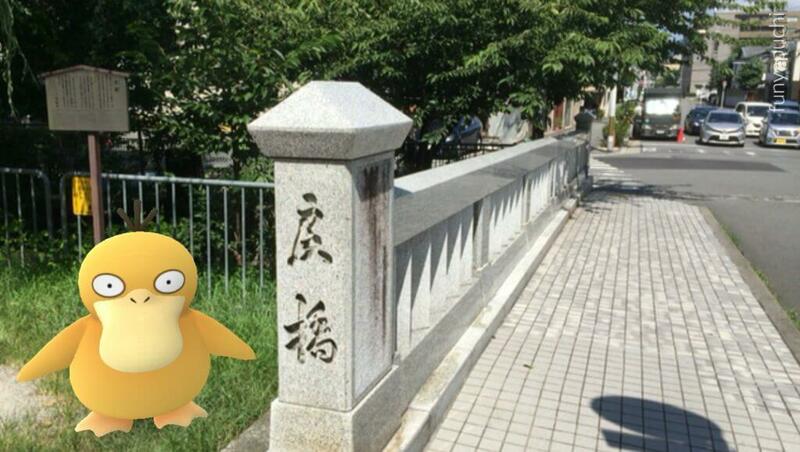 Pokemon (Kodak) appears such a sightseeing spot in Kyoto! Many people enjoy playing in the sightseeing spots which many people gather such as Kyoto Gyoen Natural Park, Kiyomizudera, Nanzenji, Kyoto Tower and so on. What is at Nintendo headquarters! ? There is a lot of players who think that “Rare Pokemon is appearing at Nintendo headquarters …! ?” This is the state of people turning in the direction of there with expectation on Twitter. Participate in each event of KYOTO CMEX and get Pokemon! ? In this year’s KYOTO CMEX, include “Kyoto International Manga Anime Fair (Kyo Mafu) 2016” in Sep.(at Miyakomesse, Kyoto City Recommended Center), Kyoto International Manga Museum, Kyoto Rome Theater). In addition to “Kyoto HISTRICA International Film Festival” in Nov. (at the Museum of Kyoto, etc. ), a series of events related to catoon / animation, movies / video, games and cross media will be held at the main places in Kyoto city. Together with Pokemon GO from this summer to autumn, please also visit each event of KYOTO CMEX. However POKESTOPs and Gyms can be found everywhere in Kyoto City, please don’t use smartphone while walking, “playing smartphone while walking”. Playing smartphone while walking can make careless on surroundings, it can be accidents such as collision with otherthings or falling from the stars. You may have an accident when you ran out into the road. A thief or a molester may attack you, too. When you stop suddenly on the small road, it’s sometimes dangerous. If accident is happened, we can’t undo. To enjoy the game comfortably, no “walking smartphone”, attention to surroundings and follow the manners. Thanks you.